Rosella Namok belongs to the Ungkum-speaking people of east Cape York. She lives and works in the Aboriginal community of Lockhart River, where she is a leading member of the Lockhart River Art Gang. The Art Gang is a group of around 15 artists, mostly under 30 years of age. Much of their work explores the daily life of the community, fishing, hunting, and ancient themes. Namok’s technique involves painting with her fingers, a method derived from the sand drawing style taught to her by her grandmother. This process is important in understanding the relationship between the painting’s very tactile and sensual surface and the painting’s subject matter. Her paintings make symbolic use of ovals and rectangles, and are often about family relationships and her country’s landscape and weather patterns. In 2003 Rosella Namok was awarded the Centenary Medal for distinguished service to Indigenous art and to the community. In recent years she has been feted as one of Australia’s most gifted and successful younger Aboriginal artists, her work attracting huge critical acclaim around the country. Her work has been purchased by the National Gallery, most state and many university collections around Australia. Namok is represented in Sydney by Hogarth Galleries. The Redlands Westpac Art Prize was Namok’s second major award in as many weeks. 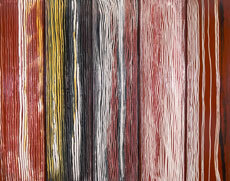 Just two weeks before the Redlands Westpac Art Prize she won the High Court Centenary Art Award in Canberra, with another major multi-panelled painting that takes Aboriginal cultural tradition as its thematic and aesthetic starting point. That painting will now be permanently installed in the High Court, while “Old Girls… they talk in the sand…” enters the SCECGS Redlands Contemporary Painting Collection.